Promote your domain name and be found by MILLIONS of daily searchers. Recommended for all businesses! Protect your domain name and personal information from identity theft and scams. Hide your 'Tech Contact information'. 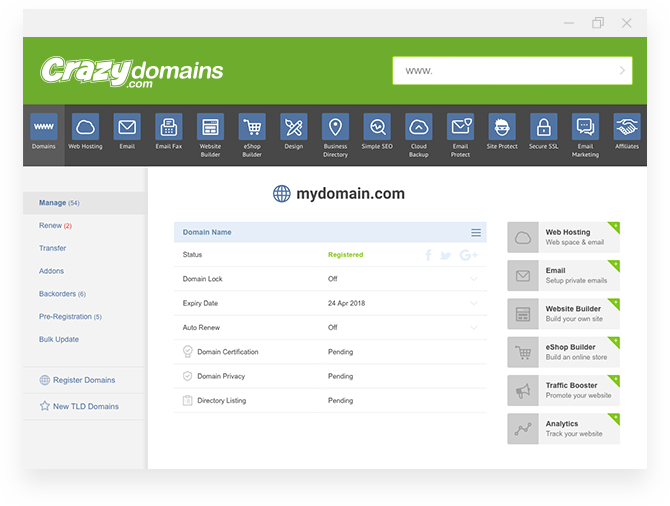 .AU Australia domains have two contact identifiers, Registrant and Tech. By purchasing Private Tech personal information displayed under this contact are not displayed on the public WHOIS. The registrant contact will remain as the owner information on whois which will result in your personal information being disclosed on whois. Full privacy is available for all non Australian Domains hiding all the 'Registrant, Admin, Billing and Tech' contact information. By purchasing Full Domain Privacy all personal information displayed under these contact are not displayed in the global public WHOIS database. Learn More.